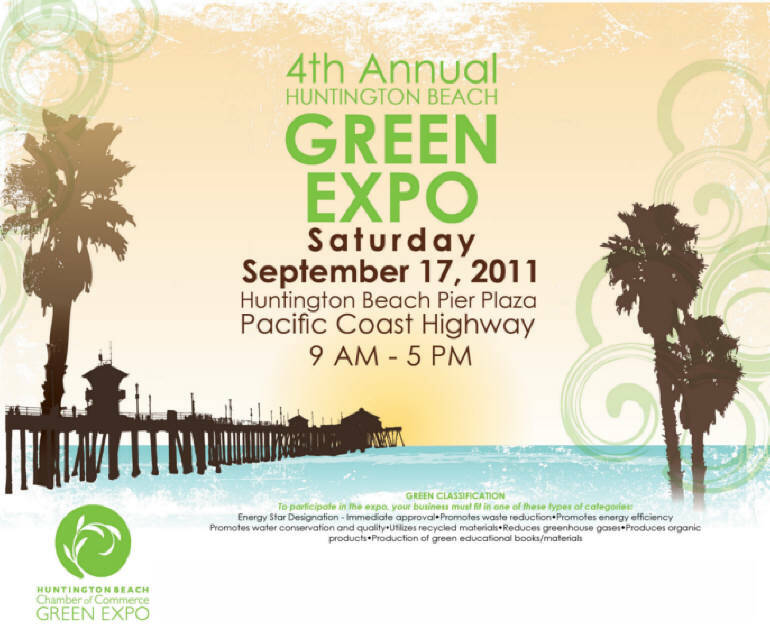 The 4th annual Huntington Beach Green Expo arrives Saturday, September 17, and runs from 9am to 5pm. It will be located at the HB Pier Plaza on the corner of PCH and Main St. The free event put on by the HB Chamber of Commerce is a vendor showcase of goods and services. A good place to learn a lot about the latest in green technology. An important element for anyone in California and especially those in Huntington Beach. After all, the city is leading the country in environmental issues and sustainability. There are coastal wetlands with miles of protected lands for birds, fish, and all the large mammals that feed on them (dolphins, seals). There is the recycling rate that was best in the State at 71% up from 45% in 1995. The local waste company, Rainbow Recycling, will be at the Expo. If you’ve been down to City Hall or Central Library then you’ve seen the solar panels in the parking lot. These panels are expected to turn 40% of building energy use to solar. Several solar companies will be at the event. Finally, there is the contentious plastic bag ban on all single use bags. The city council is largely split on this issue and so are the residents, but it is likely to pass. That is not to say that we don’t have our issues. In a recent post, I explored the surfboard industry and found out that surfboards are dirty. I mean super toxic and not at all recyclable; something Surf City can’t ignore.